You gain 4 life. If a creature died this turn, you gain 8 life instead. 7/14/2017 You won’t gain more than 8 life if more than one creature died this turn. 7/14/2017 Life Goes On checks whether a creature has died during the turn only as it resolves. Would it kill them to put "target player" on these lifegain spells? My Tainted Remedy deck would've loved a 1-drop bullet. The only spell coming close to this is freakingFeed the Clan the other similar one is Chaplain's Blessing, but that is sorcery speed. Also this is common. would 100% pick it if i am running G/W or if i get a Sunmare. 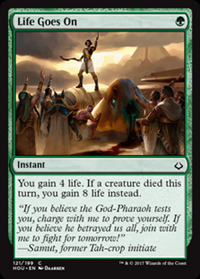 Good card overall; I just hate it when they directly use a mechanic (in this case morbid) without citing it because gods of mtg forbid we continue to use keywords in new sets that aren't evergreen.